Robbie Parsons played a key role as AFC Rushden & Diamonds’ season seemed to click into gear over the bank holiday weekend. The frontman joined Diamonds on a permanant basis during the summer, having been with the club on a dual registration with Wealdstone during last season. The former Northampton Town player never really hit the ground running during the last campaign. But he has wasted little time this season. 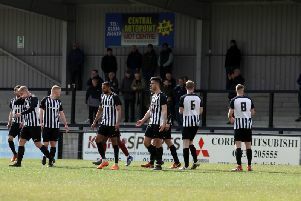 Parsons grabbed Diamonds’ second goal in last Saturday’s 3-1 success at Carlton Town as they registered their first win of the season in the Evo-Stik Northern Premier League Division One South. And that was quickly followed by their second on Bank Holiday Monday as Parsons opened the scoring in a 2-0 victory over previously unbeaten Bedworth United in front of nearly 500 fans at the Dog & Duck. Parsons has been given the task of filling one of the wide areas left by the departures of Claudiu Hoban and Shawn Richards over the summer. And, as Diamonds prepare to entertain AFC Hornchurch in the first qualifying round of the FA Cup this weekend, Parsons’ displays have earned high praise from boss Andy Peaks. “Robbie has gone away during the summer and bulked himself up,” the Diamonds manager said. “We lost some key wide players after last season and that has opened up an opportunity for him. “He has done very well in that area in a 4-4-2 formation and he can be pleased with what he has done so far. “He has scored a couple of goals, which will really boost his confidence. “It was a lovely goal against Bedworth, he showed a lot of composure when he was one-on-one with the goalkeeper.